It is almost impossible to have a conversation about SIP trunking without relying on a vocabulary that probably sounds pretty foreign to people who aren’t involved in telecommunications on a regular basis. SIP itself is an acronym, so right off the bat, we’re throwing out lingo. If you are a reader of this blog, you know that we try to write in plain English and explain telco terms when we use them, but I’m sure we’ve dropped the ball on that a time or two. We thought it might be helpful to lay out some of the most common terms used in SIP trunking and VoIP (there’s another one). If you are considering making the move to a digital solution for your business voice needs, you might want to bookmark this page and refer back to it as you do your research. ATA (Analog Telephony Adapter): An ATA is a small, inexpensive device that converts an analog signal to a digital one. It is used to add analog devices such as legacy PBX or key systems, overhead pagers, or door alarms to a digital network, such as an SIP-based phone system. CDR (Call Data Record): A CDR is data about a phone call. It includes the duration, time, origin, destination, billing information, and other details about a specific call. Codec: In SIP trunking, a codec is software that compresses and decompresses voice signals over the network. The codec used by your SIP trunking vendor determines how much internet bandwidth you will need for each call. DID (Direct Inward Dial): Direct inward dial is a service that lets users assign specific, 10-digit phone numbers to individual people within a PBX system. IVR (Interactive Voice Response): An IVR allows callers to use menus to interact with the phone system and with integrated application data. For example, if you call your bank to get your account balance, you are interacting with an IVR. Jitter: Jitter refers to the variation in time that it takes each packet traveling over a network to reach its destination. In terms of SIP, jitter creates a poor audio experience. Latency: Like jitter, latency is an audio quality problem in SIP trunking. It refers to the amount of time it takes a packet to reach its destination. When latency is too high, voice calls can be degraded to unacceptable levels. MOS (Mean Opinion Score the Mean Opinion Score): MOS is a numerical scale that rates the perceived quality of digital voice transmission. The scale goes from 1 to 5 with one being the lowest audio quality and 5 the highest. POTS (Plain Old Telephone System): POTS is the basic telephone system with which we are all familiar. It consists of a single phone line and a single phone number. PRI (Primary Rate Interface): A PRI consists of 23 channels on a T-1 line. Most traditional business phone systems are served by one or more PRIs. PSTN (Public Switched Telephone Network): The PSTN is the combination of local, long -distance, and international carriers that make up the worldwide telephone network. SIP trunking is used to deliver calls to the PSTN. Rate Center: A rate center represents the geographic area used by local carriers to set rates and issue phone numbers and for billing. When moving from traditional phone lines to SIP trunking, it is important to choose a vendor that can secure DID numbers in your choice of rate center(s). SIP (Session Initiation Protocol): SIP is a standard protocol for internet-based communication including telephony, video, messaging, and conferencing. 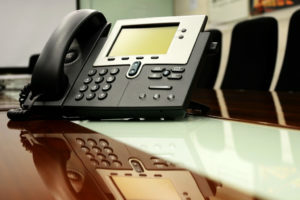 SIP Trunking: SIP trunking makes it possible to connect a PBX to the internet, enabling business communications without the use of PRI lines. VoIP (Voice Over Internet Protocol): VoIP It is a broad term that covers any phone call made over the internet, as opposed to traditional telephone lines. SIP is one protocol that enables VoIP. These aren’t the only telco terms that you will likely come across when reading about IP-based business communications, but they are some of the most common and most important. Did we miss one that you’d like to learn more about? If so, just drop us a comment and we’ll be happy to add it to our list.